The idea of leadership possesses us whenever we think about organizations. Whether we are thinking about our nation, our workplace or the parent-teacher association at our kid’s school, we inevitably turn to evaluating the quality of leadership. We instinctively recognize that leadership is the driving force that energizes and focuses the efforts of the organization, and we all know individuals who have the knack of leadership. They build and motivate engaged workforces, communicate with clarity, and make key decisions that resolve issues and grow the organization. They lead in good times or in bad. We also recognize destructive leaders who sow discord and confusion, all the while making wrong decisions. Quality of leadership makes an unquantifiable difference to an organization; it is the foundational force that either holds it together or tears it apart. Leadership effectiveness is the place to start when conducting an organizational assessment, as leadership touches every aspect of an organization, from the articulation of mission to the execution of core tasks. The Pathfinder Performance Model (see below) reflects the importance of leadership as the foundation of a high-performing organization. Leaders must define and articulate the mission and ensure that it provides the focus for vision and strategy. Leaders then ensure that values and capabilities align with mission, vision and strategy. Moreover, leaders guide the teams that operate core projects, business processes, talent development and performance management that enable the organization to grow. Finally, leaders play a key role in creating and sustaining the organization’s culture and execution systems. Leadership is truly the indispensable component of a high-performing organization. Evaluating leadership is difficult because of the diverse range of tasks performed by leaders. Leaders must build a leadership team, make tough decisions, engage and empower employees, communicate, ensure accountability and be politically astute. It is important that an assessment of organizational leadership covers each of these tasks. 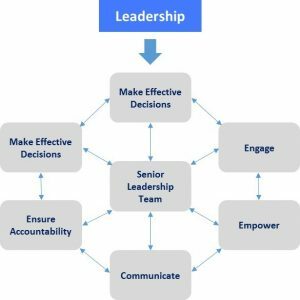 Create a Senior Leadership Team: Leaders surround themselves with other senior leaders who work collaboratively as a unit. Make Effective Decisions: Senior leaders prioritize and inform decisions that address critical issues and provide a clear focus of work. Engage: Leaders rally people at all levels of the organization to be highly committed to their work and to the organization. Empower: Through personal integrity, respect for others and commitment to the mission, leaders establish a level of trust that empowers all members of the organization. Communicate: Effective leaders communicate in a productive, clear and consistent manner with all key stakeholders. Positive communication goes both ways, relying on the essential abilities to listen, understand and receive feedback. Ensure Accountability: Leaders establish clear expectations and address failures to live up to and meet commitments. Exercise Political Skill: Leaders effectively manage internal and external relations. Each of the attributes of effective leadership requires a unique set of skills. For each leadership attribute, there is an established body of knowledge that leaders can access to improve their performance, and successful leadership development programs will feature specific, proven programs along these tracks. Before you sign up for leadership training, either for yourself or your organization, pause for a moment. Assess your organization’s leadership against the seven attributes described above and make sure your leadership development effort is targeted on the attributes that most need improvement. 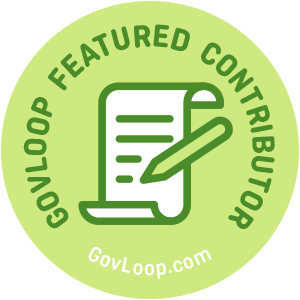 Dr. Andrew Pavord is a GovLoop Featured Contributor. He is a former government executive who currently is the CEO of the Federal Consulting Alliance. 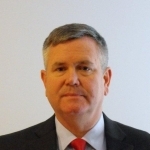 He led budget processes for DC government, SBA, and Treasury, managed department headquarters operations for Treasury, and served as chief of staff to the CFO of the Department of Veterans Affairs. Read his posts here. This was helpful! I think everyone can point out good and bad leadership when they see it, but the Pathfinder Performance Model makes it easier to articulate exactly what areas leadership is excelling in, what’s lacking and then determine how to improve in those areas.